I have at least three of these woody shrub like volunteers in my garden, and I still can't ID them... Help? Are the stems bamboo-like (hollow center, segmented)? If so, Japanese Knotweed. At first glance it looks like a young Black Gum (Nyssa silvatica). Naturally I spelled something wrong- Blackgum. I was just researching for a tree in my front yard that is a very difficult to plant location. It was a staging area when this community was built -- nearly 30 years now, but it still has super compacted clay soil under the thin loam of the lawn, plus less than ideal grading brings a lot of rain water to that spot. I was looking at descriptions for Blackgum and thought.... Wait, didn't somebody say those shrubby things might be Blackgum? Sorry -- I didn't realize I failed to thank you for the possible ID. I must have taken photos of their fall foliage. I'll have to go look for them. You're welcome. 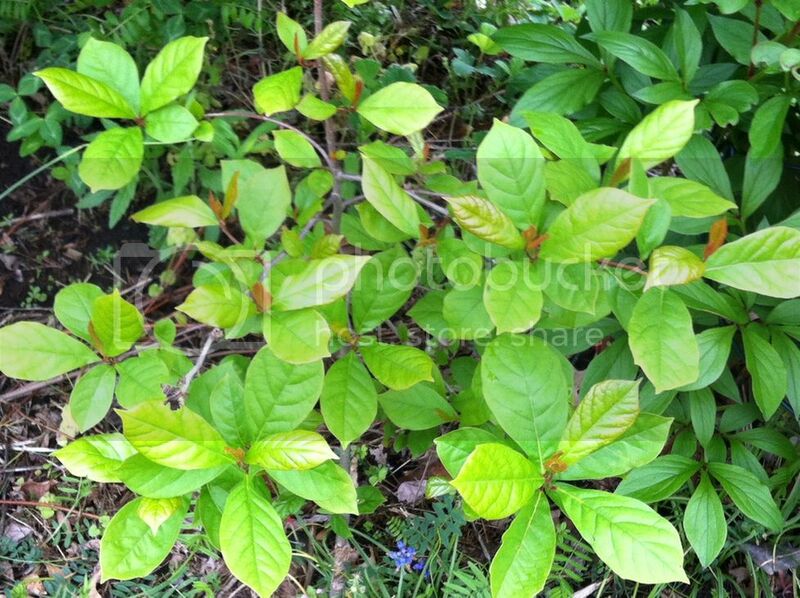 It also looks like a newly leafing Calycanthus floridus -Sweet Shrub. That damp spot sounds like a great spot to grow a fast and happy Bald Cypress, They even have weeping one's now which are very cool with age (don't let the ugly Charlie Brown's christmas tree appearance fool you when it's young). As for a the Black Gum, it's my understanding that they don't mind wet situations as long as the soil is good. They are slow anyway, but clay would make they wait for a large tree even longer. I would also make a point of selecting a container tree because they don't care for transplanting to begin with and having all roots intact will make for a much faster adjustment period.